In a poor economic climate, a columnist at the American Enterprise Institute claims cosplayers are too busy dressing up in costumes to get jobs. 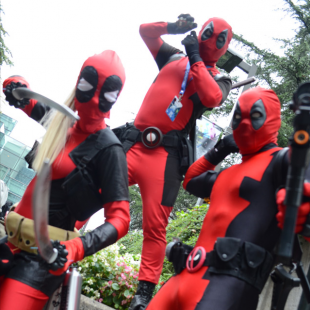 Cosplayers signal bad signs for the U.S. economy, James Pethokoukis, American Enterprise Institute fellow and columnist, wrote yesterday in The Week. Pethokoukis examines the economic situation of Japan - decades of stagnation that now hurt Japanese young adults who are unable to find permanent jobs and live with their parents. Pethokoukis cites an interview with Masahiro Yamada, a Chuo University sociology professor, which states many young people have taken to dressing up as heroes and escaping to games, anime, and cosplay. Yamada states economic growth in Japan has declined while the rate of unmarried people has increased. "After all, it's not that these young adults in Japan are resisting becoming productive members of the economy - it's that there just aren't enough opportunities for them," Pethokoukis writes in The Week. So an increasingly large number of them spend an increasingly large amount of time living in make-believe fantasy worlds, pretending they are someone else, somewhere else. This is a very bad thing for the Japanese economy." Transitioning to a poor economic situation for young adults in the U.S., Pethokoukis notes cosplay visibility has increased recently. Last year the show Heroes of Cosplay premiered on SyFy, and more attendees have started cosplaying to large events such as San Diego Comic-Con. This weekend in New York City, cosplayers are attending New York Comic-Con in costumes they either made or purchased. NYCC even has a cosplay craftsmanship competition. This all takes place during a slow economic recovery in the U.S. Pethokoukis uses this to argue, "When you're disillusioned with the reality of your early adult life, dressing up like Doctor Who starts looking better and better. It's not to say that all or even most cosplay aficionados are struggling to find work. It's only to say that any rise in people fleeing reality for fantasy suggests problems with our reality." However, evidence shows that many different kinds of people cosplay. Last year, Business Insider asked cosplayers attending New York Comic Con about their jobs and found that while many cosplayers were students, many also held jobs in teaching, security, and finance. Some cosplayers even make costumes and attend events professionally, such as Yaya Han of Heroes of Cosplay. Li Kovacs works with Nintendo to model as characters for upcoming games. Pethokoukis' previous article in The Week argued American businessmen are ruining the U.S economy.